I am Therefore iPad: Before you Buy AppleCare for your iPad - Read this! Before you buy that AppleCare for your iPad, you should know what it covers. Every iPad comes with complimentary telephone technical support for 90 days from your iPad purchase and a one-year limited warranty. With the AppleCare Protection Plan, you can extend your service coverage to two years from the iPad purchase date. You can call Apple's technical support experts as often as you like and get your questions answered. And if you need repair service, they offer some service options. So without AppleCare, you are covered against defects in materials and workmanship under normal use for a period of ONE (1) YEAR from the date of retail purchase. With AppleCare, you get TWO (2) YEARS from the date of retail purchase. So make sure you save your receipts and/or credit card statement that shows the purchase. So the warranty is for "defects in materials and workmanship under normal use". What if you dropped the iPad? This is not normal use of the device! How about you left it on top of the car and then pulled off? Not normal use. What if you fell the sleep with it on the bed and then woke up and found it on the floor with a cracked screen? You are out of luck! (i) if any Apple serial number has been removed or defaced. * Service coverage is available for battery depletion of 50 percent or more from the original specification. So basically if your iPad's issue is not excluded above, you have the following options available. SquareTrade offers a different deal, plus everything you get with AppleCare. With the SquareTrade you care covered for normal usage issues and accidents: drops, spills and full submersion in liquid. What is covered with SquareTrade iPad Warranty? 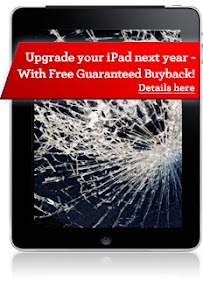 3 years of coverage The SquareTrade iPad warranty covers your item for 2 or 3 years, starting on the date of purchase. Accidental Damage from Handling (ADH)Most tablet PC and Laptop failures reported to SquareTrade are caused by accidents. The SquareTrade iPad warranty protects against drops, spills, and other accidents! Deductible: There is no deductible for any claim. Ordinarily, a $50 deductible would apply to ADH claims only, but SquareTrade has waived the deductible. Exclusions: If your warranty is bought on the same day as your iPad, then your coverage begins immediately, if you buy your warranty on a later date than your iPad, accidents occurring in the first 30 days are not covered. ADH does not include loss, willful damage or damage occurring through gross misuse of the item. The damage must have occurred unintentionally while the item was being used as intended. No Coverage from Loss: There is no coverage against lost or stolen items. You can always cancel your warranty and receive a refund if that happens. The SquareTrade warranty also extends the same coverage as the Apple manufacturer warranty from 1 year to 2 or 3 years. This covers all mechanical and electrical problems that arise out of normal use. This includes most hardware failures and power/charging failures. No deductible: If your iPad fails because of a mechanical or electrical problem during normal use, there is NO deductible to claim. After Apple manufacturer warranty: During the period you are covered by the manufacturer, SquareTrade will refer you to the manufacturer for issues covered by the manufacturer warranty. The SquareTrade iPad Warranty is $95.99 (regularly $119) compared to AppleCare at $79. Learn more at the SquareTrade website.